The only Reform synagogue in Netanya, Israel, our partner city, was recently vandalized. 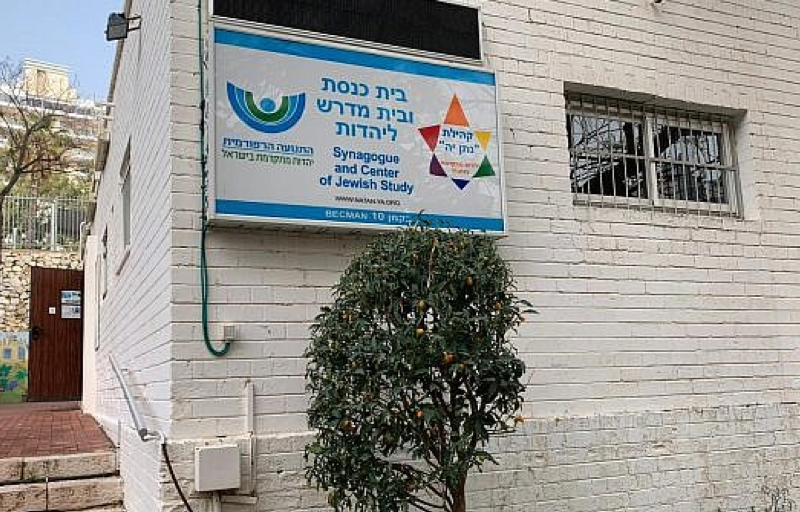 It is with great sadness that I report to you that the only Reform synagogue in our partner city of Netanya, in Israel, was vandalized on International Holocaust Remembrance Day, January 27, 2019. The Natan Ya congregation members arrived that morning to find their sanctuary flooded with roughly 2,500 liters—over half a foot—of water, said the temple’s Rabbi, Dr. Edgar Nof. Sometime the previous night, the vandals had broken through a locked protective fence, destroyed the congregation’s garden, jimmied open the barred window leading into the sanctuary, brought a garden hose into the window and turned it on full blast. The damage is extensive. The tile floor, furniture, and prayer books, including books of the Talmud, the siddurim, were ruined from the flood. “Cleaning work has begun. Damage was already found to prayer books, bibles, Rabbi Nof’s guitar, amplifier system, carpet, and so on. Luckily no damage to Torah scrolls or the Aron HaKodesh,” reported synagogue member Reuven Marko, who is also chair of the Israel Movement for Reform and Progressive Judaism. The Jewish community of Cincinnati has a history of close relations with not only the people of Netanya, but also Congregation Natan Ya. Rabbi Nof, who has visited Cincinnati several times and has spoken at Wise Temple, is a pioneer in bringing Reform Judaism to Israel. The volunteers who serve on our Federation’s Board and committees have made it a priority to partner with Israelis to support pluralism—i.e. that different ways of practicing Judaism are available and respected. For example, our Israel & Overseas Planning & Allocations committee has voted to provide some funding to Congregation Natan Ya for the past two years. These dollars come from your contributions to the annual campaign. Rabbi Nof has reached out to the Federation and asked for our help with rebuilding. The Federation has allocated $1,000. If you or anyone you know would like to help, please contact Marci Blachman, Director of Agency Fundraising & Special Gifts, at 513-985-1519 or mblachman@jfedcin.org. As of now, 10 days later, the police investigation is ongoing but the perpetrators are still unknown. Two other synagogues were also vandalized: on the same day, another incident of vandalism took place in a second Netanya synagogue, MacDonald International Shul, which is Orthodox. Two days later, a Modern Orthodox synagogue in Jerusalem’s Kiryat Ha Yovel neighborhood, Siah Yisrael, was also vandalized with ritual objects destroyed. Rabbi Nof said that for the past two to three years, the congregation has been targeted roughly every other month. He attributed the increase in attacks to the synagogue’s success in attracting new members. In the past five years they went from one to two bar mitzvahs a year to, in 2018, celebrating 72. Although Natan Ya is celebrating its 50th anniversary, there remains surprising amounts of misunderstanding and disrespect for non-Orthodox Judaism in some segments of Israeli society. Thanks for posting Shep. It is always helpful learning about the important news that you post. I am sad to think that there is division among Jews. We are all one family and indeed the Kodesh Barchu would not want any of us to hate each other. Thou shalt not hate thy brother in thy heart. Jews are hated among the Nations and we should all embrace each other. Shalom to each one of us.